Shoe laces don't usually attract a lot of attention. That being said, simple shoes can be enhanced with the right choice of laces, and even the most sophisticated shoes can diminish in quality when paired with cheap or clashing laces. It's worthwhile to pay more attention to the laces on your shoes. 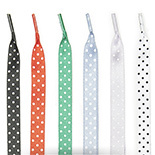 Thin waxed shoe laces made of 100% cotton. Available in five different lengths. 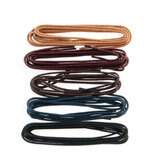 Medium-strength, waxed round shoe laces made of 100% cotton. Available in two different lengths. The close of the 18th century saw the rise of the shoe lace, as it replaced the showy shoe buckle. 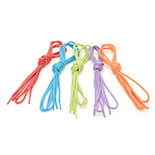 Today shoe laces are available in a wide variety of materials and in the wildest colours. The right choice of shoestring can truly enhance a shoe’s appearance —the wrong choice can wreck the look. Traditionally, shoe laces don’t attract a lot of attention. They’re included with shoes upon purchase, and as long as neither of the laces tear, they’re given virtually no thought. However, shoe laces significantly affect overall shoe appearance. Even the highest quality footwear can be look ridiculous when paired with the wrong shoestrings. On the other hand, shoes that aren’t as sophisticated can enhance their profile with high-quality shoe laces. 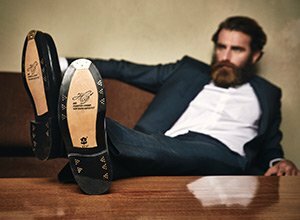 There are many different kinds of shoestring on the market, but careful consideration will reveal that only a few are well suited for high-quality business shoes. Shoe laces first came to England in 1792. This simple type of closure caused the large, shiny buckles that had been popular up until that point to gradually fall out of fashion. Richly decorated buckles were a status symbol that went out of style with the advent of the French Revolution. From that point onwards austerity dominated men’s footwear, and shoe laces, which were originally only used for women’s shoes, enjoyed increasing popularity among men. 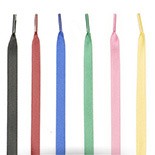 Today shoestrings are available in a variety of materials and a range of colours. Cotton, synthetic fibres, cotton-synthetic mixes, and leather are all woven or plaited into shoe laces. These are then either left as is or waxed, and can be further divided into flat or round laces, which are suitable for various kinds of shoes. The ends of the laces are called aglets. These are welded together to form a nib, encased in plastic film, or fitted with a metallic cap. Aglets prevent shoe laces from fraying and make it easier to guide shoestrings through shoe eyelets. When selecting shoe lace length the number of eyelets on the shoe should be taken into account. Shoes with two eyelets require laces that are 45 centimetres long, whereas shoes with six eyelets require laces that are 90 centimetres long. When it comes to boots, which typically feature ten eyelets, one should reach for 180 centimetre-long varieties to ensure that the shoe is properly laced. 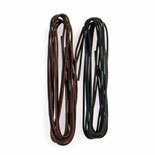 Thin, waxed cotton shoe laces are the best choice for high-quality footwear. They’re highly water resistant and far longer lasting than their unwaxed counterparts. They’re also visually appealing; waxed shoe laces don’t flop around on the upper, but rather maintain their form.